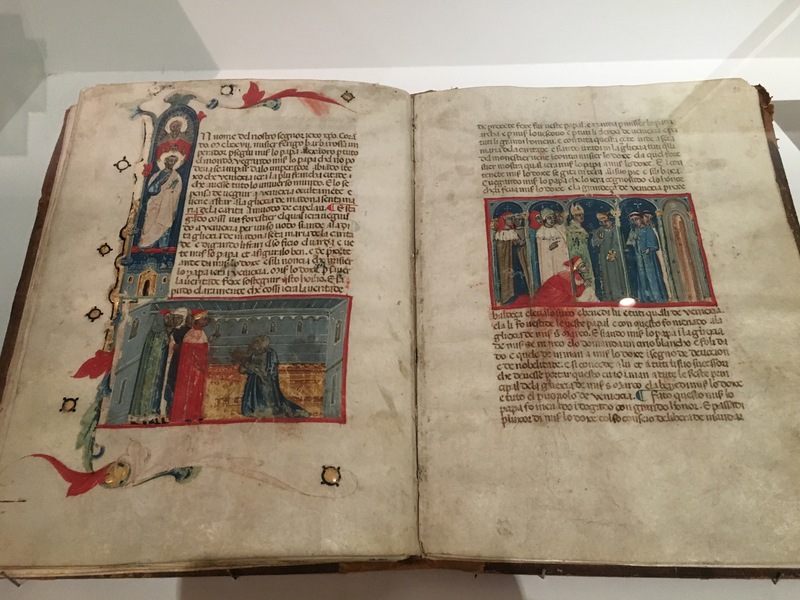 Today was busy, with visits to the Natural History museum, the museum of perfumery and costumes, the Acadamemia galley, and finally the Correr and Ancient history museums. In there somewhere we also managed to eat. The natural history museum had a mix of traditional displays with groups of items labeled with their Latin names, and some interactive elements. 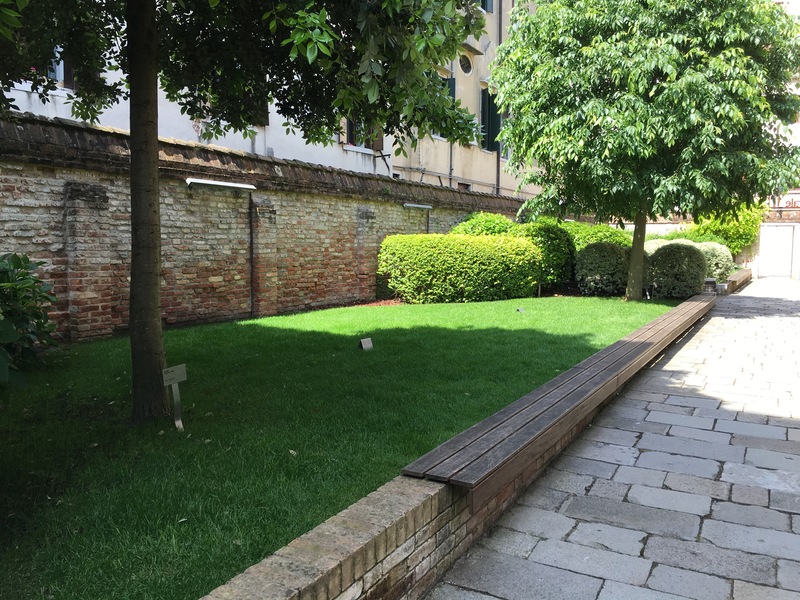 The museum also had the first garden we’ve seen in Venice. Keep off the grass! 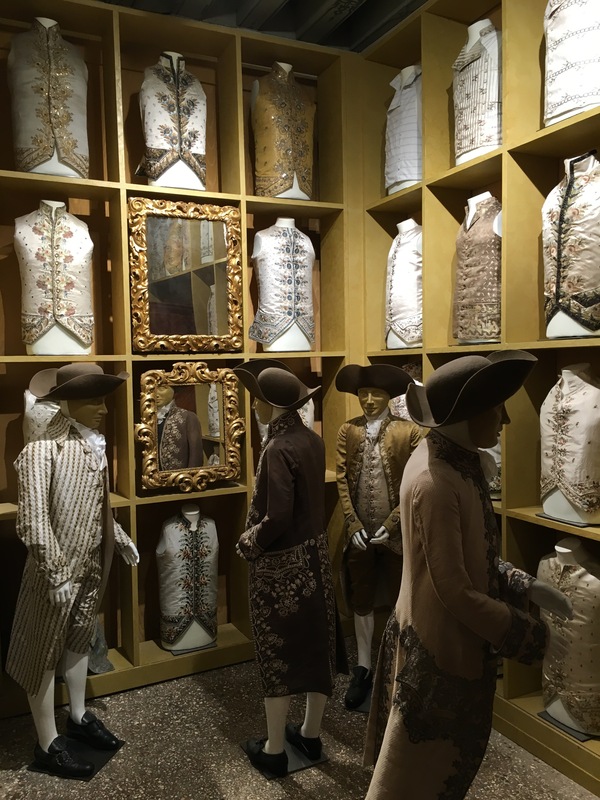 The museum of clothing and perfume had clothing from a number of eras and included this display showing the evolution of the jacket. 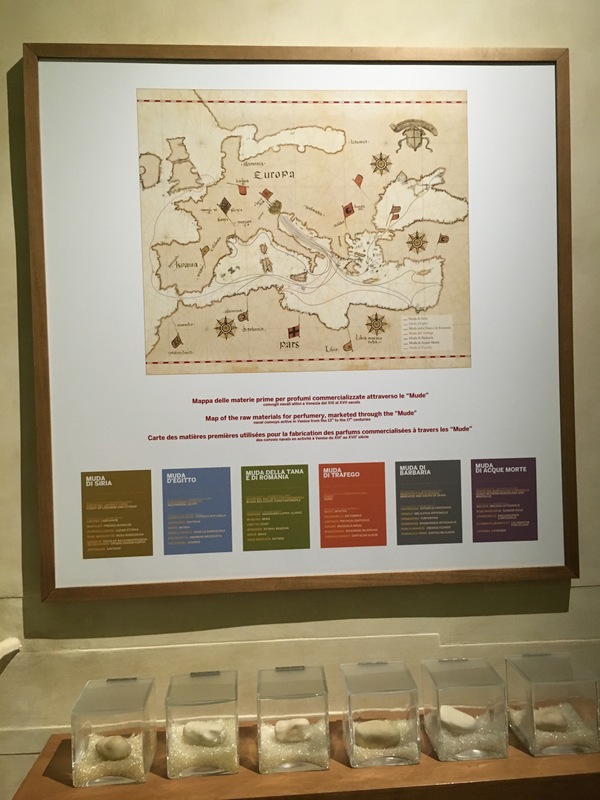 Even more interesting to me was a history of perfume, showing where the spices and fragrances came from and have ‘sniff stations’ to demonstrate regional differences in how these base elements were mixed. They also had a display of ancient perfume-making ware. 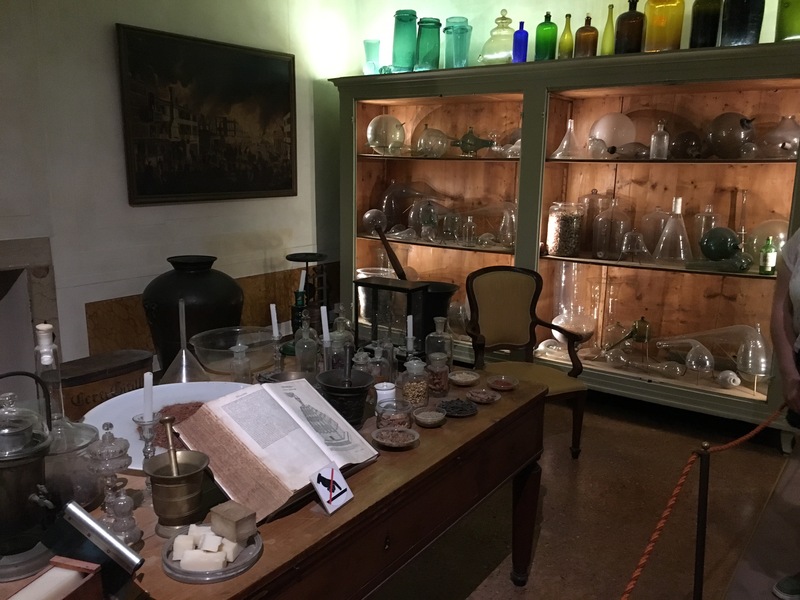 At the end of the perfume history section was a table devoted to the base and heart scents used to build perfume. 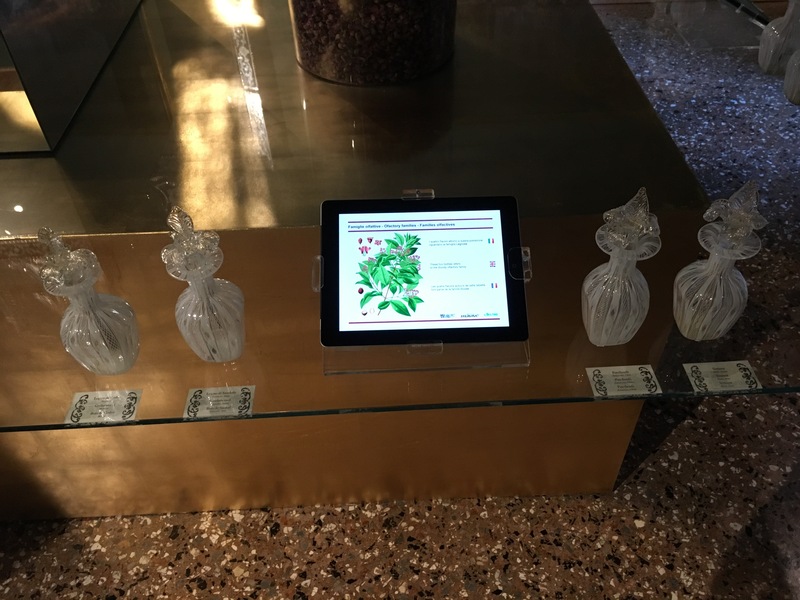 It was possible to smell each one and read an explanation of its role in perfumery. 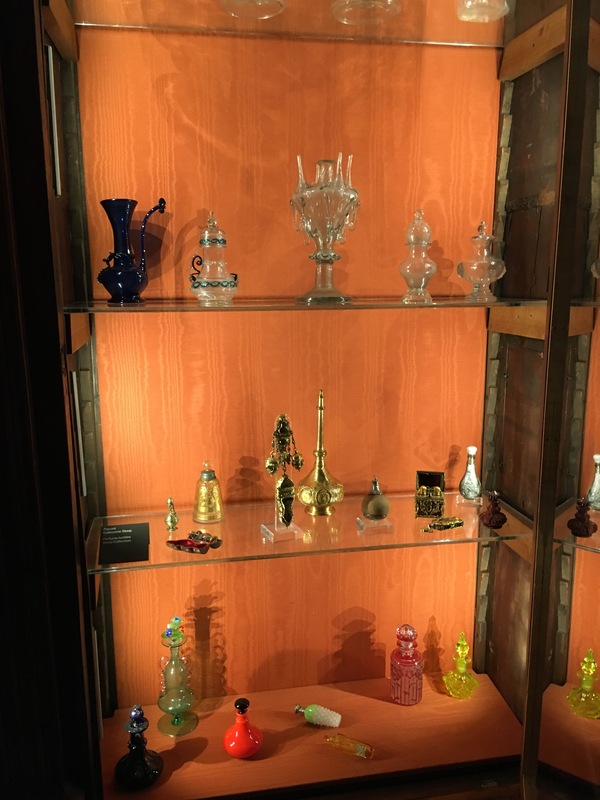 Last, but not least, a large display (multiple cabinets) of perfume bottles through the ages. The museum is a palazzo (palace) that was gifted to the state, and they’d set up many of the rooms with the original furniture or items from the period. This is the dinning room. 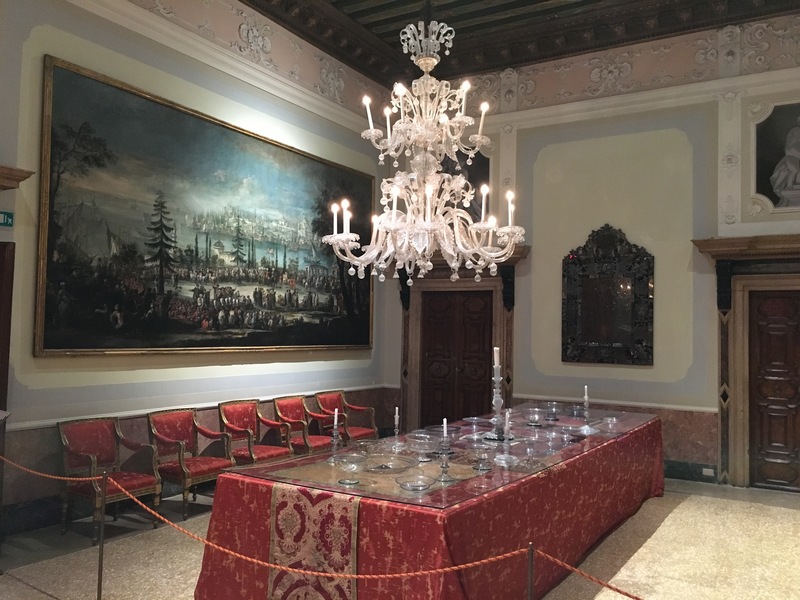 Check out the chandelier – every room had one of these, made from Murano glass. From there we went on a water bus rude to the Academia Gallery. 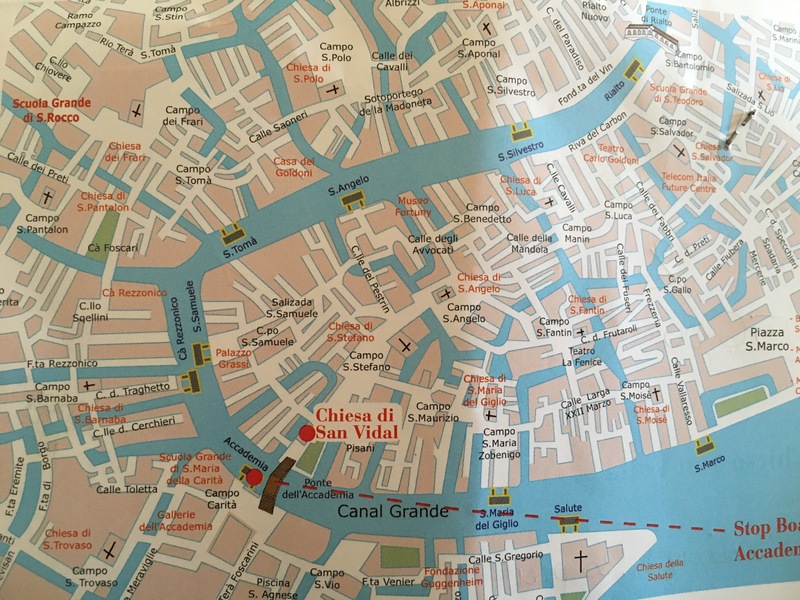 Everyone uses the water buses to get along the Grand Canal (or a water taxi at €1.80 per minute). We got a three day pass, which is pretty mandatory as each ride is €7.00, and you must have a ticket. On one trip an inspector moved through the cabin checking all the tickets. The academia has many great works of art, all beautifully restored. In one case they described the pain-staking process used to analyse the canvas and paint, and any previous restorations, before any work is done. 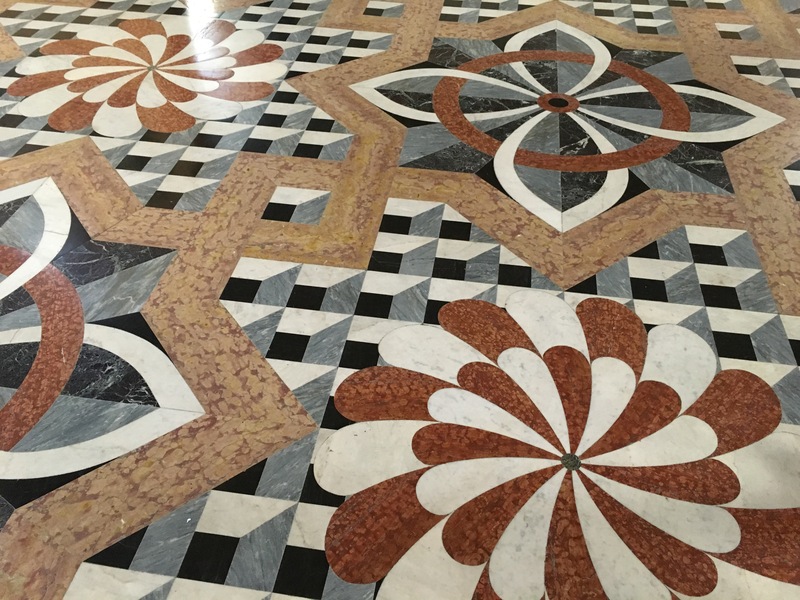 It also has an amazing floor. I’ll show you two paintings. 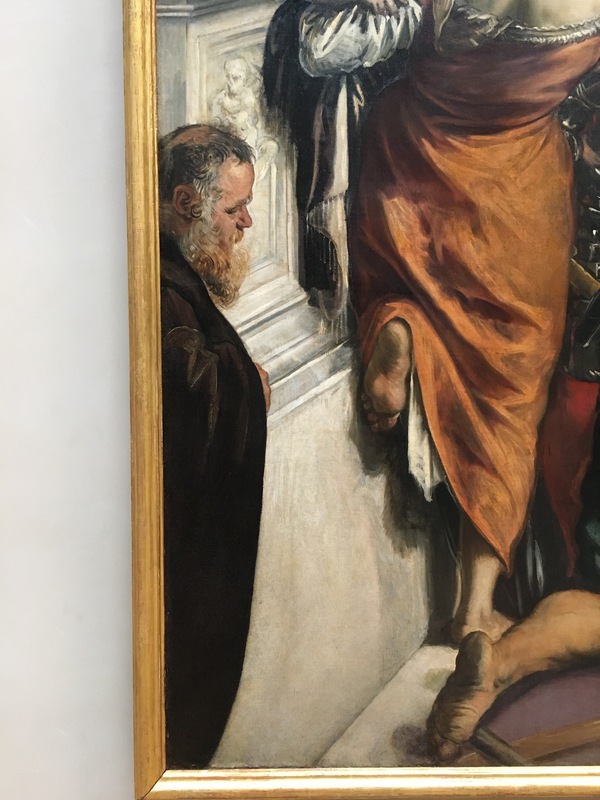 The first is St Mark Frees A Slave by Tintoretto. 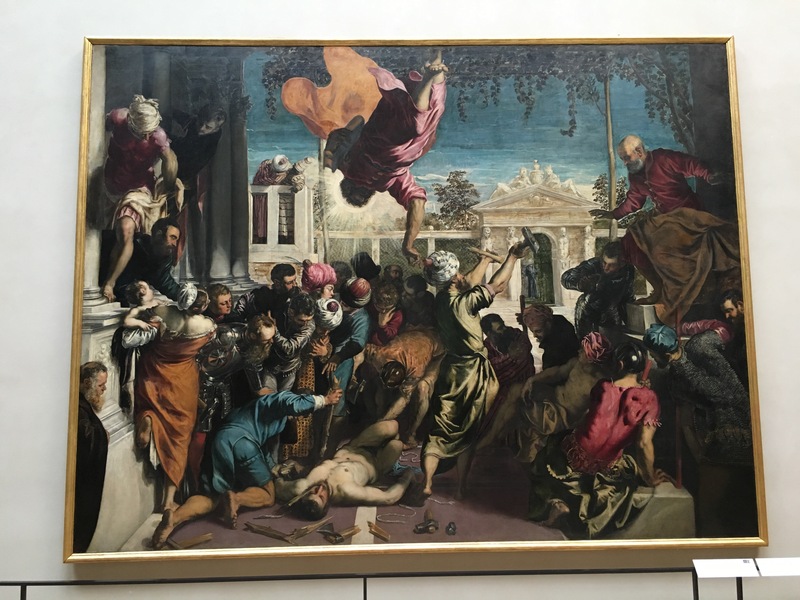 As well being a dramatic masterpiece that shocked and inspired the artist’s contemporaries, in the bottom left corner the artist himself can be seen. 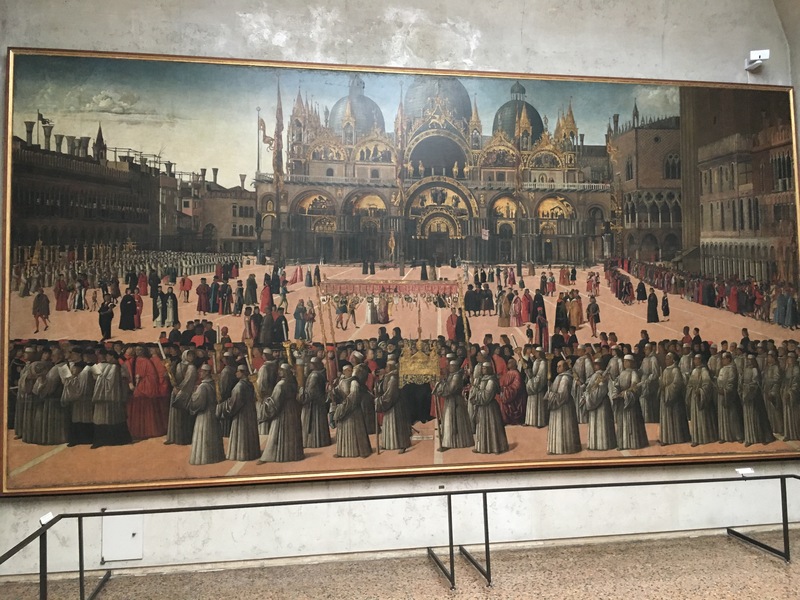 The second painting is Procession in St Mark’s Square, painted around 1496 by Bellini. 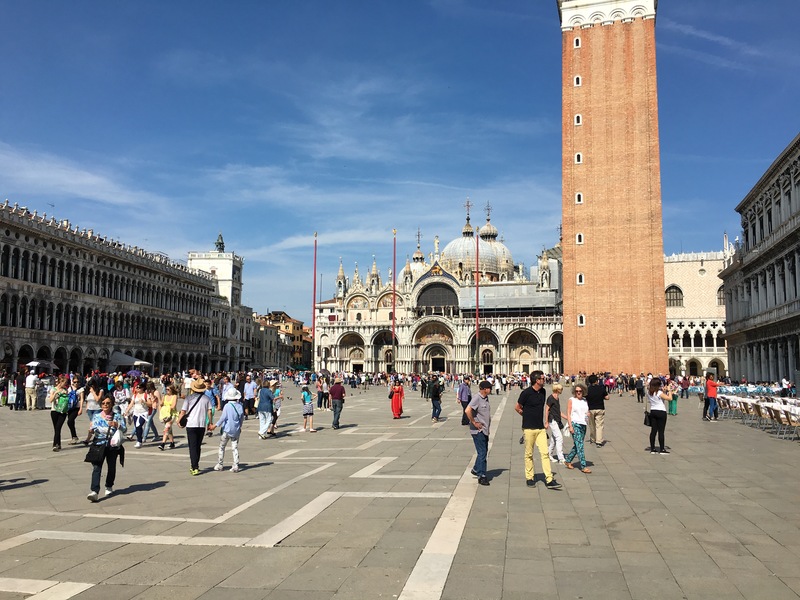 This was also very striking, and I decided to go and take a picture from the same vantage point in St Mark’s Square. Seen below, the tower was added after the painting was completed, but you can see the Doge’s palace and St Mark’s in the same places. The Correr museum, in the Square, was vast with thousands of items on display. At this stage of the day my brain was running out of capacity to consume any more art, and it was hard to pick what to write about. You shall have to be content with some pictures from the collection of books. 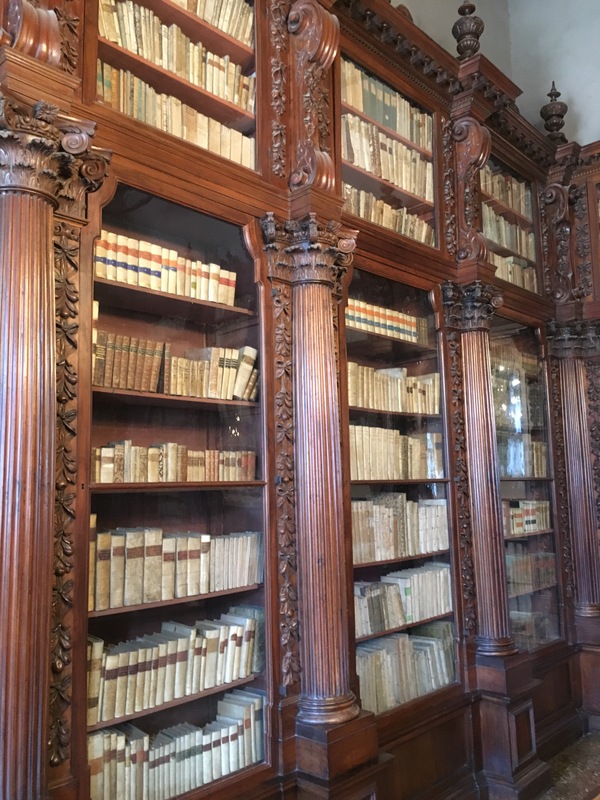 Now this is what I call a library! 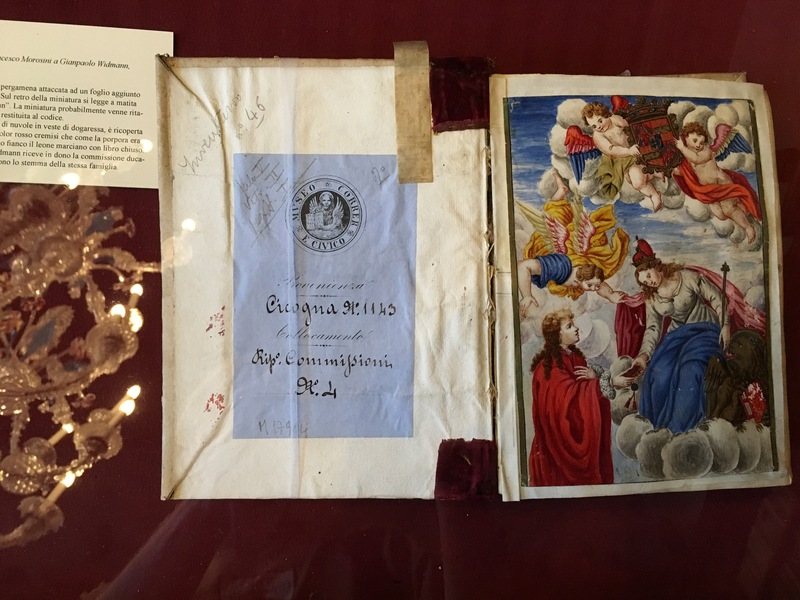 Here are a few images of the books on display. 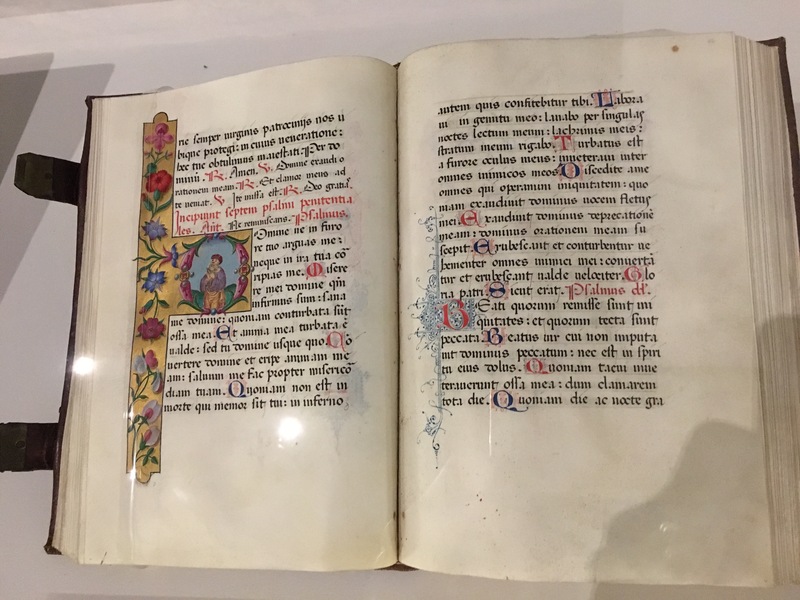 Remember that these were all written and illuminated by hand. 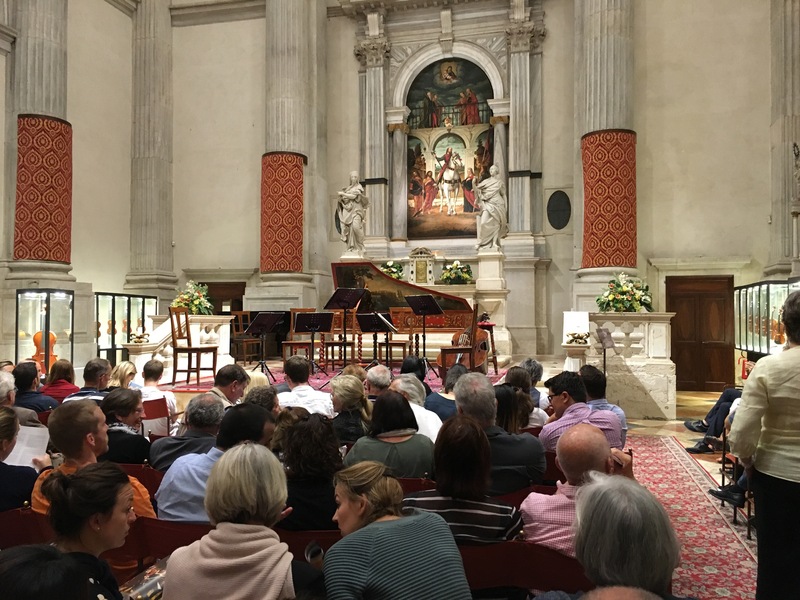 At night we went to a concert by Interpreti Veneziani playing a programme of Vivaldi. The group are one of the top exponents of Vivaldi, and the concert was in a church built around AD1084. The ticket has a map on the back. Good idea. This is a shot of the stage just broke the artists came on. Tomorrow it’s off to Zoagli. Most locals here haven’t heard of it. I hope we can find it because I’m driving there. I suspect GPS will be involved.